Give us 22 minutes, Newsradio KQV promises these days, and we'll give you the world. There was a time when that 22-minute investment in KQV would have brought a different return - one that have might have included the Sons of the Pioneers, the American premiere of a new Beatles record or the lineup for a "Shower of Stars" show at the Civic Arena that just might include the Strawberry Alarm Clock. There have been may twists and turns marking the path of KQV - and the radio industry - since the station first powered up its transmitter in 1919. The station is celebrating its 80th anniversary this year - just a whisker before KDKA, which is credited in the history books with the first licensed commercial broadcasting on Nov. 2, 1920. "We allege that we began to do informal programming in 1919,'' said Robert W. Dickey Sr., president and general manager of KQV. "KDKA alleges it did the first formal broadcast in 1920. We don't fight them one way or the other." KQV actually signed on the air as 8ZAE on Nov. 19, 1919. It soon became known as KQV ("King of the Quaker Valley," legend has it), and the federal government officially granted those call letters on Jan. 9, 1922. In its earliest days, KQV - like most radio stations - functioned as a sales tool for radio sets. The Doubleday-Hill Electric Company owned the station and had a vested interest in selling radio receiving equipment to a skeptical public. "They were on Liberty Avenue, and they wanted to sell all the little gizmos it took to build a radio set," Dickey said. "So they'd get a guy to go upstairs and play some stuff and downstairs on the showroom floor, they'd let the prospective customer hear it." The studio of amateur radio station 8ZAE was the home of what would become KQV when the when the station received its commercial license. From those modest beginnings, KQV soon became a full-fledged radio station. Dickey said the station's research shows that KQV had a regular schedule of programming a few months after KDKA launched its daily lineup. KQV didn't air commercials, though. Radio historian Dennis Burns reports that founder G. Brown Hill didn't think radio should be a commercial enterprise and didn't accept advertising until 1925. From the beginning through the 1950s, radio was the nation's mass-market medium. Like magazines before and television after, stations attempted to appeal to listeners of all ages and genders with a wide variety of programming, much of it provided by networks. "I think at one time or another we've been affiliated with nearly every network that came down the pike," Dickey said. KQV was part of NBC's Blue network, then became an affiliate of Mutual Broadcasting System and later, CBS. The networks provided news, soap operas, comedy, drama, quiz shows and live music - the kind of entertainment mix that marked pre-cable network television. Conservative commentator Fulton Lewis Jr. was one of KQV's evening draws, and remote broadcasts from hotel ballrooms were a staple in the big-band era. KQV also spent significant time as an independent station and hopscotched around the dial, occupying a number of frequencies before it settled at 1410 AM on March 29, 1941. Like any station, KQV developed its stars. Herb Morrison, famous for his vivid eyewitness account of the Hindenburg disaster ("Oh, the humanity"), once served as KQV's news director. Bill Burns came to work at KQV after serving in World War II and soon moved to another floor in the Chamber of Commerce Building to help invent local television news at Dumot's WDTV. Afternoon personality Al Nobel was also an early TV favorite. Pirates Hall of Famer Pie Traynor had a long run as KQV's sports director. The ownership of the station changed over the years. At one point it was owned by the Brennan family, which also owned WHJB in Greensburg. WJAS was also part of the portfolio and shared facilities with KQV. "The on-duty announcer had a toggle switch," said Dickey, who started his career as an announcer. "You would press the switch one way to give KQV's call letters and the other way to give the WJAS call letters." Radio began to change dramatically in the 1950s. In 1952, the FCC removed restrictions on television licensing - imposed because of World War II - and the new medium exploded. In infancy, television networks were spin-offs of radio networks and were supported financially by profits from radio broadcasting. But as television's popularity mushroomed, the balance of power shifted. Advertisers were eager to buy time on a medium that described and showed their products to consumers. One by one, radio's biggest stars slipped away to television - some, like Jack Benny, to tremendous success; others, like Fibber McGee and Molly, unable to make the transition. In addition to competition from television, the radio stations faced brutal competition from one another. Radio stations began to search for ways to stand out in the pack. KQV, muddling along with a stale format, was sold to ABC, which had an idea. The 1927 license was granted by the U.S. Department of Commerce, which oversaw regulation of the broadcast industry until the creation of the Federal Communications Commission in 1934. In December of 1957, ABC acquired KQV and decided to radically change its sound. It went with a fledgling Top 40 format that had been born in the Midwest. Radio lore holds that a programmer in a diner noticed customers pumping coins into a well-stocked jukebox, playing the same records over and over. The concept of repetition was tested on radio and, fueled by the nascent form of rock 'n' roll, instantly commanded large, loyal audiences among teen-agers. 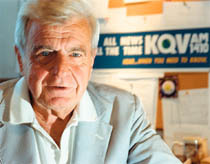 KQV took the plunge, but was still saddled with must-carry ABC programming like Don McNeill's "Breakfast Club" - a jarring interruption to the all-hits format every morning. KQV promoted itself as "The Live One" in ads trumpeting the new format. Ralph Beaudin was appointed general manager and brought in Sam Holman as program director. One of the first stars was Rod Roddy, an evening DJ who went on to fame decades later as the announcer for several game shows, including the "The Price is Right." Roddy wore hospital scrubs and gloves and performed for the crowd that gathered outside the picture window studio at Seventh Avenue and Smithfield Street. "He was the most talented guy who worked at the station in the early days," said Chuck Brinkman, who joined the staff in 1960 and stayed 12 years. "He would literally have 200 or 300 kids outside the window from 9 p.m. to midnight. He put on a show. That's what started the window craze." Early on, the decision was made to move into the ground floor of the Chamber of Commerce Building to create visibility for the station. The studio faced Seventh Avenue and was wrapped in corrugated siding painted bright blue. Scott named it "the Corner of Walk and Don't Walk," and the station posted signs with the names of the on-air talent. "It always reminded me of how they put labels on the animal cages at the zoo so you know what you're seeing," said Alan Boal, who was KQV's news director and one of the few employees retained when ABC took over. Some DJs, like Roddy, enjoyed the window. So did Kris Erik Stevens, who spent less than a year at KQV in the late 1960s on his way to his dream job at WLS in Chicago. "The fishbowl studio was extremely cool," Stevens said. "I recall a steady stream of Steel City ladies sliding by to flash me while I was on the air." Boal recalled a regular who liked to climb up on the ledge and dance along with the music that was piped to an outdoor speaker. "One day he took a header," Boal said. "The police and medics were out there treating him while the DJ was trying to do his show." On Oct. 17, 1919, Frank Conrad fired up equipment in his Wilkinsburg garage and started a revolution. The Westinghouse engineer is credited with the first broadcast of the human voice, and a group of volunteers is struggling to create a national monument to Conrad and the radio industry here in southwestern Pennsylvania. After an initial rush of excitement, KQV began to stagnate. John Rook was hired as program director in late 1963 and engineered a strategy that turned the station into a powerhouse. Rook had come from a highly competitive situation in Denver, and his first order of business was to tighten the presentation. "There were two different kinds of radio in those days, West Coast and East Coast," Rook said. "East Coast radio was not a Top-40 type of format. It was heavily personality: talk, talk, talk, play a record, talk, talk, talk, maybe give the call letters. The biggest problem was it just didn't have any excitement." Rook's mantra was "always forward motion ... we don't want it to stop." Then he tackled the problem of escaping KDKA's shadow. KDKA and KQV were the only stations in the market with call letters that began with K. KDKA had a 50,000-watt, clear-channel signal; KQV broadcast at 5,000 watts. KDKA also had the advantage of having its letters constantly reinforced by a TV station. Rook introduced "Audio 14" as an alternate identifier. He quickened the programming pace. Music was the station's main draw, so he scheduled as much as possible. He brought in Hal Murray from Minneapolis, Big Steve Rizen from Texas and all-night man Dex Allen from Denver. Al Julius was also imported from Denver to bring his unique style to news and commentary. "Basically we were looking for things that were going to make us stand out and make people notice us," Rook said. Rook overhauled the music to a more mainstream pop sound. The station was starting to hum at an opportune time: the Beatles were about to revolutionize pop music in the United States, KQV was ready on the ramparts when the British Invasion hit. Test your memory - try this quiz based on programs from radio's Golden Age. A. Where did "the elite meet to eat"? B. When Gracie Allen ran for president, what was the name of her political organization? C. What was the name of Jack Benny's polar bear? D. The Green Hornet was a descendant of what famous crime fighter? E. When "Life of Riley" moved to television, who played Chester in the TV pilot? F. What program featured "the fabulous free-lance insurance investigator with the action-packed expense account"? G. What musician was the band leader of a top radio show and, simultaneously, the star of a radio comedy? H. What actor played Matt Dillon on the radio version of "Gunsmoke"? Rook had contacts in England who could often furnish Beatles records before they were released in the United States. KQV played the recordings as world premieres, then fed them to the network so ABC stations in New York and Chicago could tout their own "world" premieres later in the week. Thanks to a relationship with promoter Tim Torme, KQV had the inside track on presenting the only concert the Beatles ever played in Pittsburgh. In exchange for getting the Beatles on Sept. 14, 1964, KQV agreed to be the active producer of the Shower of Stars shows at the Civic Arena. KDKA's not-so-secret weapon was the late Clark Race, who drew a significant portion of the teen audience. Race had the added benefit of a cross-promotional Saturday dance show on KDKA-TV. "Our job was to have a machine going against him, and we were successful at it," Rook said. Rook was jolted when he heard Race tell his KDKA audience that he was headed to Baltimore and would fly back to Pittsburgh on the Beatles' charter plane. Rook ordered Brinkman and Allen to Baltimore to run interference. "He told us our jobs were on the line, and he didn't care what we did," Brinkman said. Allen had once worked with a man who had dated the secretary to Beatles manager Brian Epstein. Allen called the hotel and claimed to be the former boyfriend. The ruse worked. "She said she knew it wasn't the guy, but she wanted to see who had the nerve to say he was," Brinkman said. Once in the inner sanctum, the two successfully pleaded their case, arguing that since KQV was presenting the Beatles concert, it wasn't fair for the competition to have the inside track. Race's invitation was rescinded, and the story of radio one-upmanship was reported on the front page of Variety. Groovy QV lives, thanks to the Internet. 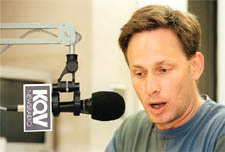 Former Pittsburgher Jeff Roteman, now a radio personality in central Pennsylvania, recently marked the seventh anniversary of his KQV tribute Web site, 14kqv.andmuchmore.com. The site includes audio of many KQV DJs, vintage photos, a message board and survey charts. Former morning man Bob DeCarlo and former general manager John Gibbs have contributed material to the site. The site www.reelradio.com includes KQV airchecks provided by Roteman and Rook. 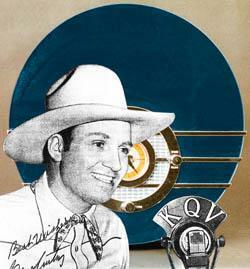 Ken R Inc., 1806 Madison Ave., Toledo, OH 43624, has compiled KQV's old jingles and issued them on several CDs. The Web site is www.kenr.com. KQV maintains its own Web site, www.kqv.com, that features live audio, a virtual tour of the studios, a program schedule and an archive of station editorials and phone poll results. By 1967, KQV was as hot as any rock station in America. Rook's energetic, clutter-free format had taken hold so well that ABC rewarded him with a promotion to WLS in Chicago at the end of the year. Before he left, Rook shifted "Breakfast Club" to KQV-FM, which was then functioning as a no-budget afterthought. "In those days, about eight people had FM sets," said Bob Wilson, who worked at KQV from 1967-73. "One little old lady complained that she had to go buy an FM radio so she could listen to Don McNeill. It wasn't six or eight months later that we put WDVE on the air, and Don McNeill went bye-bye. She wrote the longest letter asking what was she supposed to do with this radio? I felt so bad for her. That was the one listener Don McNeill had in Pittsburgh in those days." Pie Traynor also disappeared around that time. The style and grace that made him a great baseball player eluded Traynor as a broadcaster. Boal recalled a Traynor interview with a boxer who developed an instant case of microphone fright and didn't respond to anything Traynor said. That didn't stop Traynor from running down a list of 30 prepared questions that brought only silence from the frightened fighter. "We got calls from people thinking something had gone wrong with their radios because they could only hear one side of the conversation," Boal said. Traynor's departure was painful because he was such a beloved figure, but he no longer fit the station's rock 'n' roll personality. DJ turnover began to accelerate, too. Wilson said that nine months after his arrival from Omaha, he had jumped to third on the seniority list behind newsman Mark Schaeffer and Brinkman. Murray left, and Brinkman took over afternoon drive, nudging Scott into a midday time slot. Rook said he found his new nighttime DJ by accident, thanks to the station's quirky after-dark signal. "I was driving home one night through the Liberty Tubes and had just turned the radio on," Rook said. "I came out of the tunnel and heard a record that wasn't on the playlist. ... I realized the radio was picking up WING in Dayton, which was on the same frequency. It was Jim Quinn. I started listening to him and I thought, you know, that guy could do something for us. The next thing you know, I hired him and brought him to Pittsburgh." Quinn was nothing like the other KQV jocks. He came equipped with an endless supply of jokes and recorded "wild tracks" that he used to punctuate the punch lines. He screamed, he called himself "Your Leader," and the teens followed. "Jim's approach was so strong, he just set the town on fire," Wilson said. Rook added, "Jim Quinn was exciting, he was different, he brought the level of the station up to full pitch. In those days, he was a pied piper if there ever was one. Jim was a welcome addition. He did a hell of a job for us at night. I wanted each jock to sound different. I wanted the format to continue to be solid and never miss a beat but I wanted each jock to have a different personality. That concept followed me through my whole career and it worked at every stop." The word "Groovy" had become part of the language, and it was a natural for the station to become "Groovy Q-V." Wilson headed a creative department that produced memorable commercials and, for a time, a daily comedy episode of "Turkeyman." "We had heard through the grapevine that WTAE was buying the syndicated `Chickenman,'" series," Wilson said. "It was a guaranteed ratings-grabber because it was so funny. We decided to produce `Turkeyman.'" Wilson, Bob Harvey, Fred Winston and program director Mike McCormick worked on the series. What started as a pre-emptive strike against the competition became a hugely popular feature. "We wrote it about things that were happening in the city," Wilson said. "We hit the air and the reaction was unbelievable. We only did one a day, but we had to play it three or four times a day because people were calling for it. Some years later, I was talking to (WTAE program director) Bernie Armstrong and he said, `You know, you cost us 20 grand. We bought `Chickenman' and we couldn't use it because you had `Turkeyman.' We'd be called copycats.'" Quinn left the station briefly for a job in Philadelphia, but soon discovered that a bigger market isn't always better. When he came back less than a year later, KQV deftly turned his return into a major promotion. In 1968, KDKA abandoned the Top-40 playlist, shifting to a more sedate sound. That left the teen music market for KQV - until 1973. In the early '70s, the FCC decreed that FM stations co-owned with AM stations had to have separate programming. KQV-FM was one of the first to change. ABC ordered its FM stations to program progressive rock, and WDVE (The Dove) was hatched. The split cost KQV some listeners because its AM signal was no longer simulcast on FM, and the new programming was an alternative for the music audience to consider. While KQV was busying itself with the Osmonds and Partridge Family, WDVE was playing album tracks by Traffic and the Grateful Dead. There was still an audience for Top 40 on AM, though, as Cecil Heftel proved when he bought WJAS from NBC in early 1973. Heftel scrapped the talk format and replaced it with a high-energy, ultra-aggressive station he named 13Q. Heftel not only borrowed the ``Q'' - he also began hiring staffers away from KQV. Management and sales people made the trek to the other end of the Golden Triangle, as did Wilson, who had seen Heftel in action before. "I knew that Cecil was going to pour lots of money into this town with lots of contests, because that's the way he did things," Wilson said. "And I knew ABC wouldn't answer." Brinkman had already ended his 12-year run with KQV, moving to WTAE in 1972. "It was a combination of FM coming in, 13Q doing it right and ABC reacting the wrong way," Brinkman said. One of the personalities in the final days of the Top 40 format was Jeff Christie - destined to turn the radio world on its ear as conservative talk show host Rush Limbaugh. Tapes exist of Limbaugh doing bits and playing the hits as Christie on a station now called 14K as ABC struggled to counteract 13Q's impact. ABC sold the station to Taft, which experimented with a combination of talk and music. Perry Marshall worked in that format for a while. In its last days as a music station, radio vagabond Joey Reynolds came in and tested every radical programming concept that had occured to him; Hal Murray resurfaced briefly. The format was bold, innovative - and doomed. Taft knew KQV had to be reinvented, and what could be more radical than remaking the former rocker into an all-news station? It was the biggest change since the sleepy variety format was replaced by Top 40 music in 1958. All-news KQV hit the air on Oct. 15, 1976. Taft signed on for NBC's NIS (News and Information) Service, around which it would construct local news segments. It seemed like a great concept right up until the time NBC pulled the plug on NIS for financial reasons. Dickey came back to Pittsburgh in the spring of 1976, fresh from a stint as general manager of WINS, Westinghouse's all-new station in New York. He hadn't even decorated his office at KQV when someone sidled up to him at a social function with some advice. "This person, who had been in the business a number of years, told me this all-news won't last another six months," Dickey said. "He told me, get out of it and get into country music. I thought to myself ... let's see, I think they brought me in here because of my all-news experience ... and I don't know if I can twang a guitar all that well." In 1981, Taft told Dickey it was going to dump the station. "They said. `This thing is never going to get its nose above the water's edge, so let's change the format and get into something else. Let's get into some syndicated programming,'" Dickey said. "That alarmed me." Dickey believed in the format and took it upon himself to look for investors. Tribune-Review publisher Richard M. Scaife shared Dickey's enthusiasm for all-news KQV. They formed Calvary Inc. and bought the station from Taft in December of 1982. "Mr. Scaife felt the community deserved to have an all-news formatted station," Dickey said. "I put in my meager resources, and he put in the substantial balance. We would not be here except for his willingness to take a major part of the investment of this station. I had been looking but I don't think I could have found the support, and I couldn't convince Taft to keep the format." KQV's ratings performance is consistent: it doesn't draw a large audience but it gets a loyal core of affluent, upscale listeners. The format tends to attract a 50-plus audience, but Dickey said there is a growing number of younger listeners who flip in and out for business news. That kind of sampling is why all-news stations operate on a clock that recycles stories and is reflected by the "22 minutes" positioning slogan. The format is expensive; it requires lots of people, and KQV dedicates more air time than most to news rather than syndicated talk shows. KQV deviates only slightly from a news-only format. At 10 p.m. on weekdays, it airs an hour-long program hosted by Stan Freeberg that features classic programs from radio's golden age in the '40s and '50s, and on weekends it airs programs like the World Affairs Council's Sunday "Global Press Conference," hosted by George Savarese. KQV is also one of the few stations still doing editorials. Dickey dusts off his old announcing skills to present the station's take on issues. 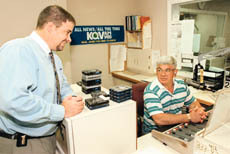 The signature feature of KQV might be the daily phone poll, and callers votes are tabulated on 333-exchange phone lines - which KQV was responsible for creating. In the 1960s, the station's phone-in contests drew such huge response that lines overloaded and blew out service to some downtown exchanges. The telephone company created a high-volume exchange for the exclusive use of broadcast stations. For the foreseeable future, KQV will remain an all-news station, running news, traffic and weather on a tight clock. "All-news radio is one of the most unique forms," Dickey said. "If it's done right, it can more nearly tell you what's happening than can any other medium. You can update more quickly, you can change a story, you can get a new angle on it. Because you're committed every hour to fill 60 minutes, the format almost forces you to do it. It fills a unique position in the total news spectrum. "I'd rather be doing this format than anything else. I ran WDVE, too, for a while, and the issue at a station like that is what are the top hits and how do you program the music? In news, you don't know your hits. It's very exciting and keeps you young. It also drives you up the wall and makes your hair gray, but it's exciting." KQV relies on CBS for national news and also runs CNN Headline News overnight. The station will keep its distinctive three-letter call sign, a badge of honor that reflects its age. Some stations have abandoned long-standing call letters to create a fresh identity, but Dickey has resisted doing that for KQV. "There are times when I'm tempted but there's the uniqueness of those call letters," he said. Although some things have changed radically - those picture window studios now house a bagel restaurant - positive memories linger. "It was such an exciting time," Rook said. "I look back on it and just say, `Wow.' Pittsburgh was just a hot place for breaking out music. We had big stars coming out of Pittsburgh with the Skyliners, Lou Christie, the Vogues. I hear those records today, and I remember the day we broke them. It was just an exciting time. It was a very special part of my life. It was the kickoff for my career." "Those were the greatest years of my life, with the Beatles and introducing all the shows, going to England to be with the groups," Brinkman said. "I don't think there will be anything like that again." But Dickey said KQV is still exciting and unpredictable. Who knows what events will shape the direction every day? And in an industry that revamps formats at a dizzying rate, KQV's all-news programming enjoys something akin to an elder statesman's status. "We were told we wouldn't last six months, and we're still here," Dickey said. 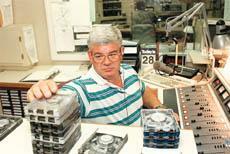 For 24 years, KQV has found the secret to format longevity - 22 minutes at a time. John Mehno is a Baden free-lance writer. 6. "Yours Truly, Johnny Dollar"
Former WTAE DJ John Williams put together a computer database that answers the perennial question, "Where are they now?" The Web site - www.440int.com - is a clearinghouse for the whereabouts of elusive radio people, who drift throughout the country, often using different names at each stop. Here are a few tidbits gleaned from the site. Chuck Brinkman is now afternoon drive personality on KAAM-AM in Dallas. Jim Quinn is in Pittsburgh, doing mornings at WPGB-FM, where his act has changed considerably. Kris Erik Stevens owns a large production company in California and works as a voiceover artist. Alan Boal is retired and lives in Pittsburgh. Bob Wilson, also retired, splits his time between homes in Beaver County and Florida and takes an occasional free-lance commercial assignment. John Rook lives on a ranch in northern Idaho and occasionally works as a station consultant. Several former KQV staffers have died, including Dave Scott, Hal Murray, Greg Scott, Gary Gears, Jay Davis and George Hart. Williams welcomes e-mail updates to make the list as accurate as possible.